More and more people are turning to online therapy as their first choice for professional help to overcome anxiety, depression and addiction. Please feel free to contact me if you would like to talk to a therapist online via Skype. Modern technology and internet access now makes it easier than ever to speak to a psychotherapist via Skype for help with anxiety, depression or other emotional problems that do not require medical treatment, which is the most common need. This service is for people who are highly motivated to change, who want to take charge of their life, but do not want to indulge in years of “talk therapy” or depend on medications. Email me if you would like to schedule Skype therapy sessions with me. I will teach you how to manage anxiety and depression using Mindfulness Therapy. This approach is extremely effective and most of my clients/students see significant changes after 3-4 sessions with me. Online Mindfulness-based Skype Psychotherapy is highly effective for stopping anxiety and depression without relying on anti-anxiety medications and antidepressants. It is far better to treat the root cause of your anxiety or depression instead of just trying to manage symptoms. People really enjoy the online therapy format because it is so convenient. Online therapy is also much less clinical in nature and more focused on teaching you practical skills for managing your emotion more effectively. Below, I have included a range of videos about online therapy via Skype. Watch them to get a feel for my approach and do feel free to email me to schedule a session or to ask questions about the process. I specialize in Mindfulness Therapy, a system that I developed in the 1980s and which is particularly effective for overcoming anxiety and depression. Most people see marked improvements after the first few sessions as they start applying the mindfulness methods (including meditation) that I teach. If you would like to talk to an online therapist, then visit my website to learn about Online Psychological counseling over Skype for overcoming chronic anxiety and excessive worrying and chronic depression, addictions, OCD, Post-Traumatic Stress Disorder, Psychological Trauma and other forms of emotional suffering not requiring medical treatment. Conventional talk therapy can be beneficial, but often it does not look at the the underlying process that is the real cause of your anxiety and depression. The same can be said for medications – the medication may provide a temporary relief from symptoms for a while, but medications are not able to are not effective for changing the underlying process that generates your emotional suffering. The style of psychotherapy that I offer is known as Mindfulness Therapy, which can be quite powerful for handling anxiety and for treating chronic depression and other psychological issues resulting from conditioned reactive thinking. Most people experience quite dramatic changes after 3-4 sessions of Skype Therapy. Welcome. 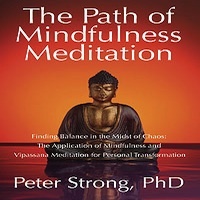 My name is Peter Strong, and I am a professional mindfulness therapist specializing in Buddhist psychotherapy, which, of course, focuses very much on changing the process that creates your emotional suffering: anxiety, depression, addiction, OCD or PTSD, whatever it may be. The focus in this approach is helping you really change the way you relate to emotional habits like anxiety or depression. The problematic relationship is where that relationship is built on habitual reactive patterns of AVOIDANCE and AVERSION, patterns of turning away from our emotional suffering, turning away from our painful emotions, turning away from our anxiety, turning away from our negative thoughts and beliefs. Wherever there is aversion and avoidance, then the problem begins. The real problem is that these reactive patterns, these habits of avoidance and aversion, prevent the anxiety or depression or underlying emotional habits from changing and from healing. They cannot change if we continue to be reactive towards them, if we continue to avoid our emotions, if we continue to react with resistance, struggle and hatred towards our mind. That will simply make those emotional habits stronger. So, if you would like to talk to a therapist online who specializes in mindfulness psychology and you would like to talk to a psychologist online, then please go to my website and learn more about the mindfulness approach and how it can help you, and then email me to schedule a Skype therapy session. The mindfulness approach is very focused and very direct. It s quite different than conventional talk therapy. Talk therapy in general, talking about our emotions, may bring about a temporary relief from the symptoms. You may feel better, but that feeling doesn’t last because we are not changing the underlying emotional habit and the patterns of avoidance and aversion that are feeding that emotional habit. The same goes for medications as well. Medications have their place, but only as a short-term way of reducing the intensity of the emotional pain. Medications are not designed to change that underlying psychological process that causes your anxiety, depression or addiction. From my experience, this approach of mindfulness is the most effective way of producing fast changes in emotional habits and many of my clients see substantial improvements after the first 3-4 sessions. It is quite a different way of working with your mind. So, I look forward to hearing from you. Thank you. Skype Therapy Service – Online Therapy Service – Talk to a Psychotherapist online through Skype for highly effective online therapy for Anxiety and Depression, Social Anxiety and Agoraphobia, Addictions, and other forms of emotional stress, including Post Traumatic Stress Disorder (PTSD). Tell me about yourself and how I can help you. Schedule a trial session via Skype now. Welcome! My name is Peter Strong and I am a professional online therapist and I offer online therapy for depression, also online psychotherapy for anxiety and other emotional problems that you may be experiencing. If you are suffering from severe depression then you should seek help from your doctor. But, for most people with depression and anxiety, what you really need are practical solutions; ways of working with your emotions that allow them to heal and learning how to break the cycle of becoming overwhelmed by emotional reactivity. This can be done very well through Skype and I will teach you very practical and effective mindfulness-based techniques for overcoming depression, anxiety and many other forms of emotional suffering. It’s also, of course, very difficult for some people to leave home: They may have family commitments at home, young children, etc, and so the online therapy option is very convenient. Many people live in rural areas and don’t have access to a therapist, or they may simply want to be more discrete in finding someone to work with and the online option is certainly very good for that, and means that you can receive help for your depression or anxiety without anyone else knowing, unless you wish to tell them. So, online therapy via Skype is growing in popularity and is a very good choice for many people. If you would like to learn more about online therapy for your anxiety or depression, please visit my website and contact me – I will be happy to talk to you and answer your questions, and we can discuss scheduling a Skype Therapy session to help you manage your depression, anxiety or other emotional problems. So, please visit my website and contact me today. Thank you! The Boulder Center for Online Mindfulness Therapy with Dr. Peter Strong. Skype-Based Online Psychotherapy for Anxiety & Depression, Traumatic Stress and PTSD, Addictions, Emotional Abuse Recovery and other Emotional Problems: A convenient and effective Online Counseling Service that you can access from home. Online Therapy is becoming increasingly popular these days since most of us have a computer and access to the internet. Skype, if you don’t already know, is a free service that allows you to make video calls from one computer to another. In my experience, this is one of the best ways to talk to a therapist online. It feels the same as seeing a therapist in the office, except that you, the client, can call from home or from the office, or even from a hotel room if you are traveling. Most people feel much more comfortable and relaxed calling from home, and it is certainly less embarrassing than waiting in the therapist’s office. This is an important consideration if you are suffering from Social Anxiety or Agoraphobia. In fact, if you suffer from agoraphobia, then online therapy may be the only realistic alternative. You may also live abroad, or live in a rural area in the US where there are no local therapists available, or that you would feel comfortable talking to. Talking to an Online Therapist via Skype is a also a great option for people who are a little uncomfortable with therapy and counseling in general. The internet option gives you more of a sense of power; that you have more control over the process. The style of Online Therapy that I provide is called Mindfulness Therapy, a modern form of CBT, or Cognitive Therapy, that focuses on teaching you how to break free of those habitual patterns of emotional reactivity that cause our anxiety, depression and emotional stress. It is also a very compassionate approach that teaches you how to heal core emotions that have remained unresolved. If you would like to talk to a therapist online; if you would like to schedule a Skype Therapy session with me, please visit my website and send me an email. To schedule online therapy. Feel free to ask any questions you may have about online psychotherapy and to discuss if this is the best approach for helping you overcome your anxiety or depression or other emotional problems. Contact me to find out more about this online psychotherapy service and to book a therapy session with me. This online counseling service is available throughout the USA, UK and Western Europe and world-wide. All you need is an internet connection and you can start online psychotherapy with Dr. Strong. The Boulder Center for Mindfulness Therapy Online with Dr. Peter Strong: Skype-Based Online Psychotherapy for Anxiety & Depression, Traumatic Stress and PTSD, Addictions, Emotional Abuse Recovery and other Emotional Problems: A convenient and effective Online Counseling Service that you can access from home. If you are suffering from anxiety, depression, addiction or any other emotional-psychological problem and you would like help resolving the underlying cause of your emotional pain rather than just treating symptoms, then please CONTACT ME to schedule an online therapy session with me. The mindfulness methods that I teach are immensely effective and most people see dramatic improvements after 3-4 sessions. Can I talk to a therapist online? Need to Talk to a Therapist Online for Help with Anxiety and Depression?